The Maine Department of Agriculture, Conservation and Forestry, Bureau of Parks and Lands manages one-half million acres of land in Maine for a mix of activities, including hunting and trapping. The safety of all visitors is the Bureau's primary concern, so certain heavily developed and high-use areas are closed to hunting for all or part of the year. In other areas, the bureau provides as many hunting and trapping opportunities as are reasonable and consistent with its mandates and with visitor safety. Hunters and trappers are asked to exercise due caution and care for the safety and enjoyment of other visitors when using Bureau lands by obeying posted information and the rules listed below. General hunting, except where specifically prohibited, is allowed from the day after Labor Day to May 31. Hunting and trapping must conform with State of Maine laws, MDIFW rules, and local ordinances. Trapping on state park or historic site land in organized townships requires the written permission of the Bureau. There is no hunting allowed in the restricted zone of the Allagash Wilderness Waterway between May 1 and September 30. Hunting is not allowed in any Memorial or Historic Site. Hunting is not allowed at Andrews Beach; that portion of Bradbury Mountain State Park west of State Route 9; Cobscook Bay; Crescent Beach and Kettle Cove; Damariscotta Lake; Ferry Beach; Holbook Island Sanctuary; Nickerson Lake; Owls Head Light; that portion of Quoddy Head within 1,000 feet of the lighthouse, or at Reid, Sebago Lake, Shackford Head, Two Lights, and Wolfe's Neck Woods State Parks. Work areas and areas with significant public use may be posted and closed to hunting from time to time in the interest of public safety. The discharging of any weapons from or within 300 feet of any designated trail, picnic area, camping area, campsite, parking area, building, boat launching site, or other developed area or bridge is prohibited. Loaded weapons are not allowed on the treadway of any trail posted "Closed to hunting". The baiting of any animal for the purpose of hunting is not allowed. The Wildlife Management District (WMD) map is available at all Inland Fisheries and Wildlife offices, or see Wildlife Management Districts where you'll find individual district maps and a list of towns and district numbers for each town. Firearms: Loaded firearms are not permitted in campsites, on marked hiking trails, at boat launching sites, or at picnic sites, and shall not be discharged within 300 feet of such areas. 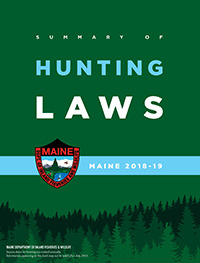 Bear Hunting: A permit is required from the Maine Bureau of Parks and Lands to place bait on Public Reserved Land for the purpose of hunting bear. All MDIFW-owned Wildlife Management Areas (WMA), except Steve Powell WMA (Swan Island) and portions of Steep Falls and Killick Pond WMA, are open for general-law hunting and trapping. A full list of these areas can be found at mefishwildlife.com Camping and fires are prohibited on MDIFW-owned WMAs. Permanent observation stands placed on MDIFW-owned WMAs require a permit. A permit is required from MDIFW to place bait on on MDIFW-owned WMAs for the purpose of hunting bear. Note: On National Wildlife Refuges that permit hunting of upland game, persons hunting upland species other than deer and turkey with a shotgun shall possess and use only nontoxic shot while in the field. More restrictive regulations may apply to National Wildlife Refuges open to public hunting. The public land within National Forests is open to hunting. Portable observation stands that do not damage live trees may be used. Please contact the Androscoggin Ranger District for more information on bear baiting on National Forest lands at (603) 466-2713. 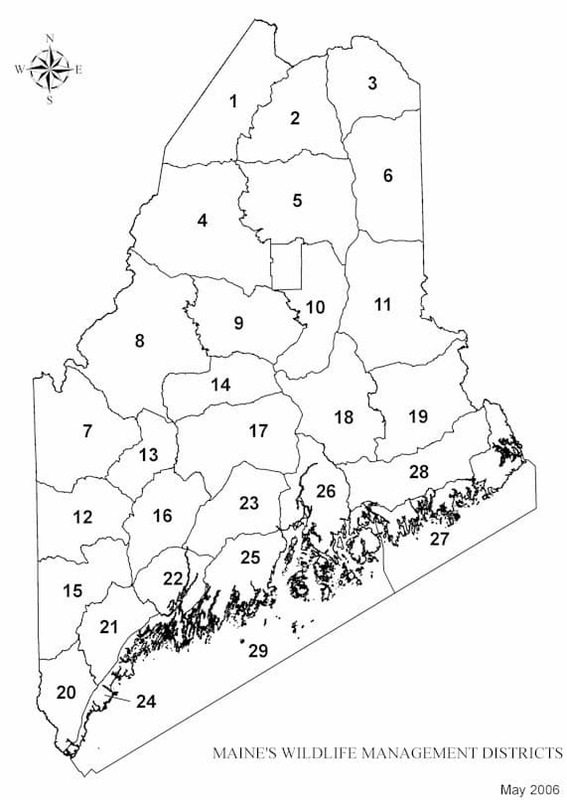 Mount Desert Island (MDI) is located within the geographic boundary of WMD 26. Unity Utilities District: It is unlawful to hunt on the Unity Utilities District Property located on Route #139 and Prairie Road in Unity, Waldo County. Gray Squirrels: It is unlawful to hunt gray squirrels on any land which is dedicated as a public or private park or on any land located within the limits of the compact or built-up portion of any city or town. Haley Pond: It is unlawful to hunt waterfowl on Haley Pond in the town of Rangeley and Dallas Plantation, Franklin County. Baxter State Park: Closed to all hunting except: The area north of Trout Brook in T6R9; in T6R10 or T2R9 and T2R10 where hunting is allowed. Beauchamp Sanctuary: Open to the taking of deer with bow and arrow during any open season that allow hunting of deer, including expanded archery. Marsh Island Area,* Old Town: Open to the taking of deer with bow and arrow during any open season that allow hunting of deer, including expanded archery. * Trapping allowed in accordance with the general laws of the State. Stand or walk on a railroad track or railroad bridge, or pass over a railroad bridge, except by railroad conveyance. Franklin County: Alder Stream Twp. Penobscot County: T2R9 NWP (western portion), T3R9 NWP (eastern portion), T6R8 WELS (western portion) Argyle Township (northern portion) and T3R1 NBPP (northeastern portion). Piscataquis County: T6R8 NWP. The Penobscot Nation also has exclusive authority to regulate hunting and trapping in the Penobscot Reservation, consisting of all islands in the Penobscot River north of, and including, Indian Island, located near Old Town, Maine. Contact the Penobscot Nation, Department of Natural Resources for specific locations of Reservation islands. Franklin County: Lowelltown, T1R8 WBKP. Hancock County: T3&4ND. Penobscot County: T3R9 NWP, T5R1 NBPP, TAR7 WELS. Somerset County:Holeb T6R1 NBKP, Prentiss, T4R4 NBKP, Hammond Township, T3R4 NBKP, Alder Brook Township, T3R3 NBKP, Pittston Academy Grant, T2R4 NBKP Soldiertown Township, T2R3 NBKP. Washington County: T5ND, BPP; T19 MD, Indian Township, and Pleasant Point, Perry. Most of these areas will be conspicuously posted as Native American Territory. Anyone wishing to hunt or trap on Native American territory should contact the appropriate Native American agency for further information.